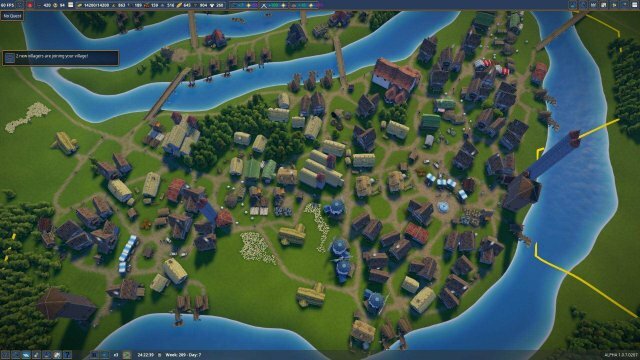 Many players have posted frustration with their cities collapsing in upon themselves once they reach certain population marks. Several of these players have posted screenshots of their towns and I have seen a lot of the same issues with them. I am here to explain a few things that make this so. I am not a dev, but I have played for many hour and have quickly come to discover many of these things while playing on stream. This guide is going to take a few things for granted. We are going to assume that you know most of the basics of the game, and instead we are going to focus on players who are having issues with expanding their economies. So first and foremost, I want to make this very clear; Distance matters. The exact level of how much it matters is unknown to me, but I do know this; it matters a ton. While your villagers are travelling from point A to point B (Usually from house to a market, job, or well) you are getting no use out of them. They do not fulfill their needs while walking, and they sure as hell do not produce food or other resources for you. This is the basic principle throughout this guide. Needs: I have suspicion that villagers will also leave work when certain needs exceed a certain level. With needs slowly rising over time, this means a wheat farmer that takes several minutes to get to his job is likely to plant one bushel of wheat before leaving work to go back home. The good news is your market tenders do not need to be at their stall to sell their goods. The bad news, is like everything else, distance matters. Try building several market stalls all over your city. It is kind of a pain, but very doable. In the screen shots, you can see I have a market set up in about a 1-1 ratio. (hex-market) This enables me to play the game where markets make sense from a city building point of view, but they are efficient enough for buyers to come buy their merchandise without ruining my economy. Since market tenders do not need to be at their stall to sell, I do not worry too much about them having to travel long distances to retrieve their goods from food places. It is still a good idea to make sure a food production facility is not too far away. In its current state, the game is garbage at placing villagers into jobs. Note that if you click a job place it has an ellipses button in the top right hand corner of the job’s window. If you click that button, it will display the closest villagers to that job, as well as the villager’s current job. If you click a villager here, it instantly assigns them to that workplace. While also not perfect, this will give you a very quick way to see if there are any unemployed villagers nearby. If not, I recommend prioritizing. Most people complain that food is impossible to maintain at a high level, so maybe you take some of those stonecutters or woodcutters off their jobs and turn them into foragers? Try to remember that the further away a villager lives from their job, the longer they spend doing nothing for themselves or your economy. I have already touched a bit on houses being far away from jobs, but as you may guess it is a little more complex than just that. Housing districts need to be close to jobs, but jobs that require other jobs (Wheat farm - mill - baker) should ideally be close to each other as well. This is for the same reason as why houses should be close to jobs: The more your villagers walk, the less they get done. You can see examples of this in my screenshots. Note how my farms are in the middle of a cluster of mills and bakeries and my sheep farms are next to weavers which are next to tailors. This allows your workers who are processing or finishing goods to walk 5 meters from their job to get the resources they need to do their own part of the process. 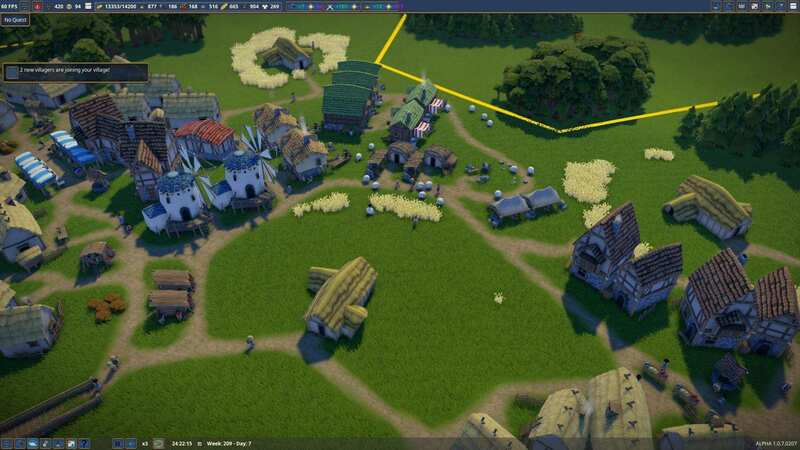 Mind you, villagers also need to walk to their work site (Lumberjack-Trees) So try to place work buildings for primary resources as close to the gather point as possible. You should also make every hex as self sufficient as possible. For some resources (like clothes and luxuries) it is not as important to have every single hex capable of making them, but as far as primary villager needs (like food) ALWAYS make sure that hex has some capability of providing that. On a water map, this means probably berries (if available) bread and fish. Of course not all resources are available in all hexes, but always minimize the amount of hexes between any given resource. This is especially true for food. During my streams, and online, I see people saying ALL the time that more warehouses are needed. Warehouses should serve only two functions in your economy; trade and storage. This is especially important to remember early game (sub 300 vils) because warehouses take up space and possibly villagers. (labor) When you do place warehouses, if they are for trade, do NOT put any labor in them. Traders from outside your city will come and drop off the goods. From there, the laborers of various buildings will come get what they need. Transporters, from what I can tell, do not deliver materials to be processed at buildings, they only take goods from buildings to be stored. This can of course be used to your advantage, by making a warehouse for primary resources (like wheat) next to a processing building (like a mill). I still do not recommend this though, and will go over why in the next section. When you decide to start expanding for whatever reason, keep some things in mind. Are there any houses in your previous area that have not upgraded in density? If so, disable density upgrades for it. 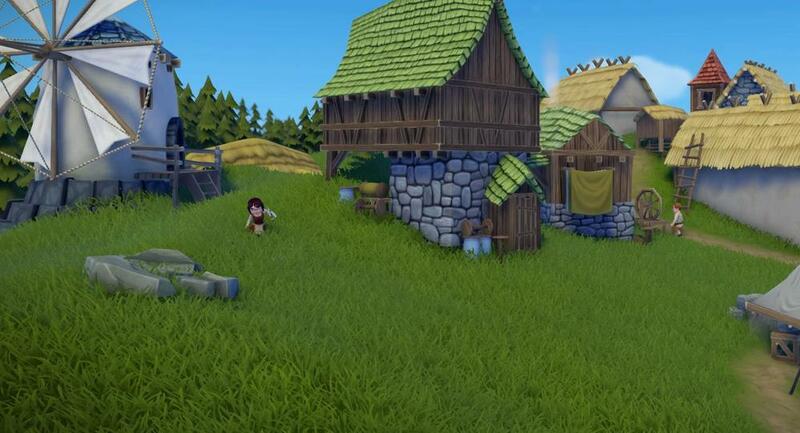 The reason for this is new villagers will move into older houses if you do not, which means some of your immigrants will live very far away from the new jobs being created in your new area. For this reason, I also recommend making sure every single villager has a job before expanding. This allows you to use the "assign available villager” button without worrying too much that your villagers are walking for minutes to get to work. I would also build a market and a housing district and wait for people to move in BEFORE assigning jobs in your new expanded area. This means only people who have moved in to your new area will be working in your new area. Of course there may be some overlap, but try to minimize that. People should ideally live work and shop all in the same hex. Rotate builders in your economy. It is kind of a pain, but how much good is the builder that needs to walk several minutes to pick up resources going to do when he also needs to walk another several minutes to drop off the materials? Rotating builders based on the zone you are currently expanding is a good way to get around this. Once you start breaking into larger numbers of villagers, it is a very good idea to start building excess wherever and whenever you can. You will find that once you have so many villagers (IF your layout is time/labor efficient) you will have more villagers than you need. 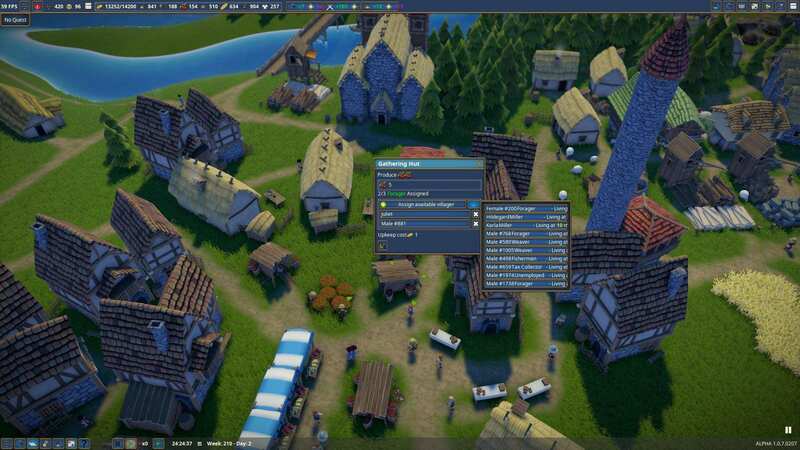 Use the villagers to stockpile resources starting with primary and working your way up. Buildings will be more efficient in the presence of excess. Excess allows your villagers to carry large quantities of primary or secondary resources instead of trying to pick up 1-2 at a time. I usually only worry about stupid amount of excess towards the 300+ villager mark. This is because I build my towns to look at least somewhat realistic and due to this, inefficiencies are bound to add up by that point. Having excess helps cut back on that to a noticeable degree. Excess can also help make your economy more resilient towards fluctuations. (which will happen). Make sure every housing district has a well. Also, bakeries should be built with a well next to them. Make sure you assign your berry bushes as an extraction zone. I know it sounds stupid, but I forget to assign it all the time and then honestly wonder why nobody is gathering from the bushes. On maps with rivers or small lakes, if you build on both sides of the water, build plenty of bridges. The pathing in this game is not too terrible, so give your villagers options so they can be more efficient. Some buildings can be built to be taller. I actually had a viewer on my stream tell me this, it never occured to me that when I placed a building, the up and down arrows meant I could actually increase it’s height. In some cases doing this will increase a building’s splendor contribution, and in other cases it increases capacity. In ALL cases though, it does increase the upkeep cost. Get at least one bailiff. You can have more than one, but I have not tested to see if the effects stack. Some effects are different from each other, so to be safe I usually get 2 bailiffs, a market and a happiness bailiff. Build a tax office in every housing district. You do not have to actually build a proper manor to place a tax office (or most other "Lord’s Manor” add ons). Like any other job, try to make sure the tax collector lives close by.